Gresham is the city located directly east of Portland. Even though many people think of Gresham as just a suburb of Portland, it’s actually Oregon’s 4th-largest city, with a population of over 100,000. The city is home to a variety of businesses, has its own city hall and municipal buildings, and provides a great education to thousands of area residents through Mount Hood Community College. For over 50 years, Cascade Building Services has worked with banks, apartments, hospitals, offices and other buildings in the Gresham area. We’ve provided a variety of commercial cleaning services. Keep reading to learn more about how we work with businesses in the Gresham area. Since 1961, Cascade Building Services has provided a variety of commercial cleaning services to banks, condominium complexes, offices and other buildings in Lake Oswego for. Continue reading and you’ll learn more about the businesses and industries served by Cascade Building Services, as well as a few of the commercial cleaning services we offer. Our commercial cleaning services are available 24/7/365. We work weekends, holidays, and nights. In other words, we work whenever you need us. We don’t interrupt your workday, get in the way of your employees, or inconvenience your customers, clients and patients. And we’re flexible. We offer the commercial cleaning services you need. And if we don’t offer something you’re looking for, just ask. We’ll create a commercial cleaning service package just for you. We sweep, mop, take out the trash, disinfect, and much more. You can rest assured that our janitorial services team will clean everything to your satisfaction on a schedule that works for you. 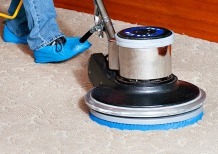 We specialize in cleaning dirty and worn-out carpets. Our biodegradable carpet cleaning products don’t leave behind strong smells or toxic chemicals. They dry fast, too! Your carpets will be dry and ready to walk on in under 2 hours. We’ll even check in with you every month to make sure you’re completely satisfied with your carpet cleaning service. We offer both preventative maintenance and regular cleanings for your building’s floors. If they haven’t been cleaned in years or were damaged by earlier attempts to clean them, we can help. Using high-quality, slip-resistant floor cleaning products from Underwriter Laboratories we’ll restore your floors to their original beauty. Recycling is important but it isn’t easy. If you’re thinking about starting a recycling program, or improving your current program, we can help. Our commercial recycling team can manage your paper recycling programming and teach your employees the ins-and-outs of recycling. Are your windows as clean as they could be? Are streaks and smears making your windows look bad? Regular window cleanings can help keep them beautiful. At Cascade Building Services, we use biodegradable window cleaning products that wash away clean and don’t leave any residue behind. If you manage an apartment complex or condo building in the Gresham area, we can help. We’ll manage the window cleaning, janitorial work, building maintenance, and any other commercial cleaning service that you need help with. Your tenants and residents will love us! Our commercial cleaners specialize in cleaning offices, banks, shopping malls, manufacturing facilities, hospitals, condos, apartments, and other businesses in and around the Gresham area. The members of our commercial cleaning teams always wear professional uniforms and identification whenever they’re working. We’re very committed to your peace of mind, safety and security. We’re also proud of our commitment to the environment and try to use eco-friendly and biodegradable cleaning supplies whenever possible. Cascade Building Services has been offering commercial cleaning services to the Gresham area since 1961– that’s over 50 years! There’s no other commercial cleaning company that can match our commitment to customer satisfaction and our desire to doing the job right. The Cascade Building Services team loves their work and the proof is in the results. We invest in our team, offering continuing education programs to help them do their best work. We’re also very proud that over 75% of our team members have been with us for over 8 years!